This are only lists of links to other suggestions! Search, if your idea has been already suggested. I would really appreciate native gamepad/controller support for this game. Especially if the controller layout remains the same if/when this becomes an XBLA/PSN title. I actually prefer mouse/keyboard, but my son has a limb difference which makes that very hard for him to use - he does every well with gamepad. I prefer mouse and keyboard myself but having the option never hurts! Have your son tried using a trackball instead of a mouse? If not, I recommend it! Especially the kind where you roll the ball with your thumb (third picture in link). our library supports joystick input. This maens, we could add option to set joystick controls in controls settings. But how would it work? You still have to click on stuff using mouse. Does he control the mouse using the joystick as well? Im interested in a working gamepad setup, sometimes factorio is more a game i'd love to sit back and relax with. I think one stick controlling movement and the other to control the mouse cursor would work well, and (for xbox gamepad at least) L1 and R1 as left mouse and right mosue respectively... Im sure i will be able to figure out a good control scheme given enough play time. Links: log-file, Applicaton directory, desync-report, update issues. I've used Xpadder before to play games with my xbox controller that have no controller support. In both designs the left analog stick controls the player movement, and the right one moves the mouse cursor. Zoom is done using D-pad left/right, and D-pad up/down allows for using the CTRL and SHIFT modifier keys. Both of these work better than I first expected, as long as you can remember every key. I also like how you still can use most of the shortcuts available, like CTRL+Click for entity transfer. However, I find myself missing some functionality on gamepad I also don't have on the keyboard, example: with the inventory open and a stack in hand, I always want to use B to first clear the cursor, and then B to close the inventory. 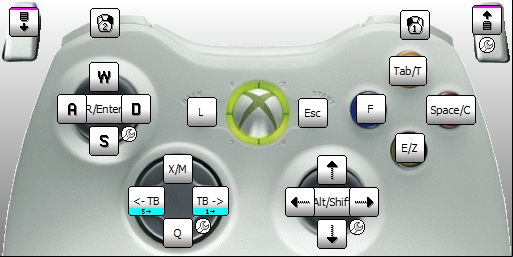 It just seems logical on gamepad for me and I never thought of it using the keyboard. I'm guessing these are things that have to be implemented in the game's engine so that buttons can have different functionality depending on the current context. Like when the game detects you are in 'Combat Mode' and some keys change their functionality. Or instead of M/T/P just one button that toggles between Game, Map, Technology and Production screens. Driving a car with the left analog stick is also pretty hard, because you expect the car to follow the direction of the stick, but it accelerates on UP and steers using LEFT and RIGHT, which makes driving straight and small corrections quite hard. One other thing I just noticed: Probably would have been a good idea to map the C key on the right analog stick when pressed down because that works fairly well, but I'm to lazy to redo the pictures now. That was just my 2 cents. I think that personally, even if controller support was added to this game, I would still prefer keyboard and mouse. I don't think the developers are planning on a console version of this game and don't see the benefit of using a gamepad for this game on the PC, because (a) it just feels more natural to me using keyboard and mouse for a game that was designed for use with it, (b) after 100+ hours of factorio the handling of the game with kb+m is pretty much ingrained in my brain and a gamepad would feel awkward and slow to use, and (c) I like the game so far and think that by adding controller support, some game mechanics or input behavior might (have to) change for it to work. L2 is E but a long press does Q, it fells very natural now to open and close crafting with the trigger. Pressing left stick toggles 'f' for picking up. Right analog controls the mouse. Shift and control are both toggles, a bit funny to get used to but it works nonetheless. I tried driving the car and it feels clunky, so i'll stick to trains. Prerequisites: More or less clear. This thread includes some very good examples. Game-value: Very good, more support for input methods makes more possibilities. GragSmash wrote: I would really appreciate native gamepad/controller support for this game. Especially if the controller layout remains the same if/when this becomes an XBLA/PSN title. I'm not sure I can visualize the game working too well with anything but a mouse, but if it can be devised, a way to control the game with a gamepad, then it'd also make the game much more playable on tablets. So yes, thumbs up for this one! I'm stopping by to see if this has been brought up before, and lo and behold it has. Gamepad support would be really nice to have. I hope that this is something that is in the works. You know that you can have up to 8 different sets in Xpadder? I never needed this feature before, but it's interesting for factorio. You can create a set for moving on foot and a second one for moving in a car or tank. If you press "enter" (for example on the left stick button), you enter the car or tank and the standard set on foot can automatically switch to the second set (set selector in advanced options, "selects set two two-way"). For the standard set on foot I suggest WASD on the left stick and F and Z on the analog triggers, for the second set (driving in vehicles) I suggest A and D on the left stick and W and S on the analog triggers. Last edited by driver on Wed Feb 10, 2016 1:20 pm, edited 1 time in total. I would love gamepad support. 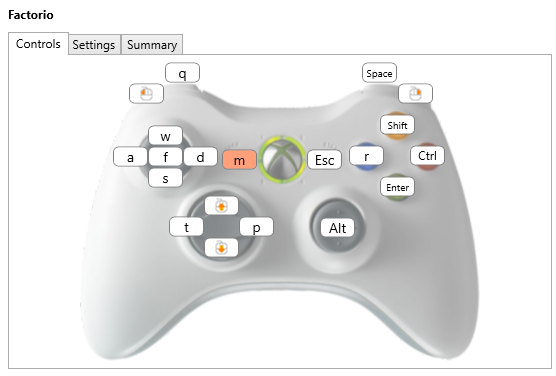 I made a configuration with the free old Xpadder 5.3 version for an xbox360-gamepad, which is quite comfortable in some aspects in my opinion, but may be difficult to understand at first or slightly confusing because it has 8 sets. You can open a profile of Xpadder with an editor like notepad and simply copy the text from the spoiler in it. I hope it's selfexplaining. What you get is a set for peaceful building with comfortable direct access to 4 quickbarslots on the d-pad (you could use a filter for semi-products in the game to block slot 5). The right stick button (de-)activates a set to zoom in or out by moving the stick up or down. Mouse action is limited to right/left here and makes use of the spring function. This (second) set also contains functions like M, F ,Z(Y). T, and P.
The left stick button offers quick access to a set for action/combat on foot or an option to return to peaceful building from combat. Click the Y-button to enter/leave vehicles. If a vehicle explodes, just press "enter" again. This set makes additional use of the A and X-button for acceleration and braking. You could change it to the analog triggers, but I prefer C and Space on the analog triggers, it's easier for dual stick action. You still need your keyboard for Esc and Tab. Might look into getting a steam controller for games like this. It isn't designed for controller support and even with programs like joytokey and pinnacle it will never feel quite right. But, a steam controller operates with touch pads and can give you a really smooth experience with games like factorio. Honestly I think the best way to support controllers is to untangle mouse only dependencies. That would allow keyboard only and controllers full accessibility. It's a lot of work to support a tiny portion of users at the moment, but I have seen games port to consoles with controller support and ignore the PC version. So if you ever add support for a game console, support the controllers right and since you are doing the work anyway give PC users proper controller support. In menus you could "Tab" though selections with arrow keys / analog stick to be equal to a hover, and press an action button to be equal to a click. Technically you could also use the selection in the main game for placing and selecting objects since it's tile/grid based so you could just move your selector around until over the desired tile, and press an action button to interact. It's intuitive but can be quite slow for expert players, especially if you want to interact with tiles on complete opposite sides quickly. The solution for a keybind to toggle to enable directly mapping 1:1 the selection to the position of the analog stick. Experts would shift into this mode, move the cursor close to where they want it, and shift out to quickly and roughly position selection in the right area to save time. For example: Pushing the analog stick 25% up would move your cursor 25% up from the center of your screen. Releasing the analog stick would return it to the center. Pushing it 100% down would be the very bottom of your screen. Of course you are mapping round stick to a square screen, so you can't get to the corners, but it doesn't matter because it's just a time saving mode to get your cursor in a rough general direction. Using 6 sets on Xpadder I was able to get the left and right buttons on the D-pad to scroll though items on the quickbar which really helped free up buttons for more bindings. Buttons with two functions require holding them down to trigger the second binding. Turbo (For the scroll wheel) only turns on when your hands are empty allowing you to zoom in & out smoothly and off when accessing the quickbar. You can get the profile from here. I wanted to make a new thread but I'll post here instead. My left hand got injured at work and is in a cast/brace so using a keyboard is impossible. Luckily my mouse has 20+ buttons on it so I can just use the analog input from the controller to move and then use the mouse for everything else. I'd really like to see support added for controllers in Factorio just for disability support. Is using third party programs the best way to implement controller support? EDIT: For clarification I would be using the controller to move only, all other inputs would be done with my mouse and it's buttons. You might want to think about somwething like the autohotkey script in viewtopic.php?f=18&t=64432#p394565 . (Most of that thread is relevant to playing with only one hand. It also contains other suggested solutions). Might look into getting a steam controller for games like this. I use a Steam controller to play. Essentially left stick is WASD with click mapped to ENTER for vehicles; the button pad is mapped to A - L for Logistics, B - E for Inventory, X - Q for Clear Hand, and Y - Z for Drop Item; the directional pad is Up and Down to zoom (using HOME and END), Left and Right to rotate (using Shift+R and R); the right touchpad is the mouse, of course, with click mapped to the middle mouse for toolbar locking; Back is M for the map, Start is ESC for the menu, and the bumpers are respectively F to pick up and SPACE to fire weapons. The triggers are mapped to left and right mouse buttons in reverse - left trigger is the right mouse, right trigger is the left mouse - and the paddle buttons underneath are SHIFT on the left and CONTROL on the right. Most of this was just pulled out of my Minecraft configuration, but the Home/End bit was pulled from someone else's Steam controller config when I couldn't get scroll wheel messages to work right through the Steam controller.